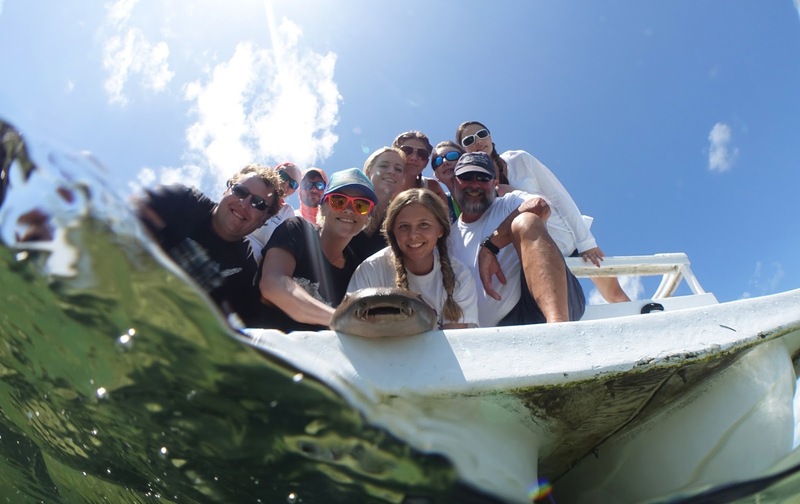 Sharks4Kids recently teamed up with Seacamp and Dr. Jeffrey Carrier for a 2- day shark science immersion program for young women in the Florida Keys. 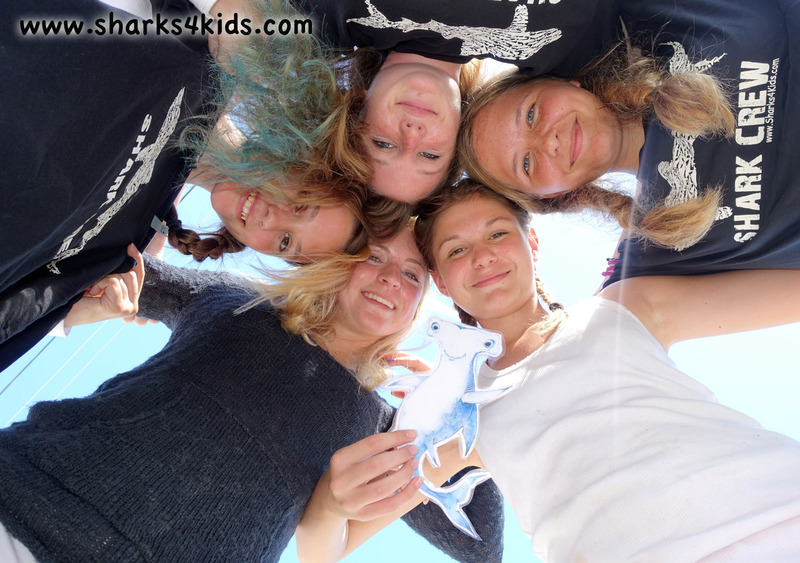 The group of eight grade students spent the first day learning all about shark biology, anatomy and conservation. When asked, many of the students were nervous about sharks, but were excited to learn more about them. In the afternoon they each got to lead the work up of a juvenile nurse shark. 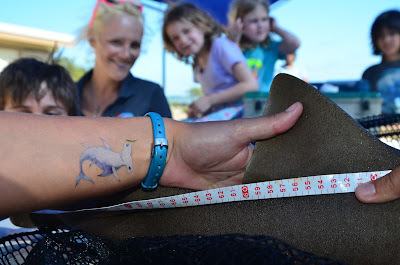 The work ups included measuring (2 length measurements), weighing, taking a DNA sample (small tissue sample from the trailing edge of the shark’s dorsal fin) and inserting a PIT tag and a roto tag. PIT (like a microchip for your pet) tags are inserted just under the skin below the first dorsal fin and the roto tags are placed at the edge of the dorsal fin. Each shark was then released. Nurse sharks are extremely hardy and during each work up their gills and eyes were kept wet. The girls worked as a team to get this done quickly and efficiently in order to reduce stress on the animal. Shark Stanley even joined in! On the second day we headed out to set lines and let the students work through the entire process of setting, waiting, catching, doing a work up and releasing the animal. I still get excited when a research line is being pulled in because you never know what you might catch and it was amazing to see that same excitement in each one of the girls. Even though the only sharks we caught were more nurses, the girls remained interested and did a phenomenal job. The high light was catching a shark they had tagged the previous day. The main goal of the project was to expose young women to real life science in action. “Before this experience I thought marine scientists only observed organisms in the lab. I did not think they were hands on with organisms, “ one student had to say. The other goal was to make them aware of the global shark crisis that is happening and how they can be part of the solution. They have the ocean in their backyard, so empowering these students is critical, especially in a state where way too many sharks are still killed for sport. “This experience made me think of reasons why sharks are not scary and why there are so many misconceptions,” another student had to say about her experience. We also discussed Shark Stanley and his role in supporting the establishment of shark sanctuaries. They loved the stickers and even the adults were eager to rock the temporary tattoos. Although Stanley is a cartoon, he has become an iconic symbol for saving sharks. Young or old, we can all make a difference and he is encouraging kids of all ages to do just that. I created Sharks4Kids to not only educate kids about sharks, but to also get them out in the ocean to see these remarkable animals. This program was extremely rewarding and provided our whole team with an optimism regarding the future of our oceans, plus it was just a lot of fun! We are planning more of these programs and Shark Stanley will join us on each adventure! Guest blog by Jillian Morris. 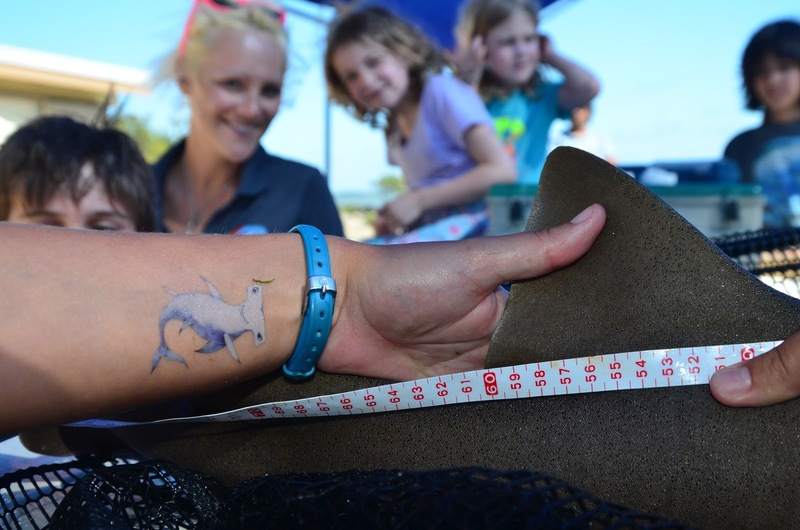 Jillian is the founder and president of Sharks4Kids, a shark education organization based in Florida. She has a behavioral biology degree and is a professional videographer and photographer who spends most of her time on the island of Bimini, The Bahamas swimming with sharks. You can follow Jillian on Twitter. What has humanity come to! always thinking about themselves and what can come next on their plate but never think about the harm they cause to the ecosystem. I admire the work!! Thank you for sharing!